The slow cooker is so perfect for making pho. If you can find precut eye of round, that makes the task even easier! There's a restaurant in Portland called Pho Kim. One day, my daughter Sasha saw their car in the parking lot of our New Seasons. They have a personalized license plate with the name of their restaurant on it. She was asking me why my husband didn't come with me to pick her up from school. I told her he was exhausted from flying home from his job in Alaska, so he was napping. The next thing I heard was her exclaiming the name of the restaurant. "What?!" I asked her? Did I just hear her curse her dad? "Pho Kim!" She pointed at the license plate. I started laughing, and when she realized how it sounded, she did too. We're making fond memories in Oregon. 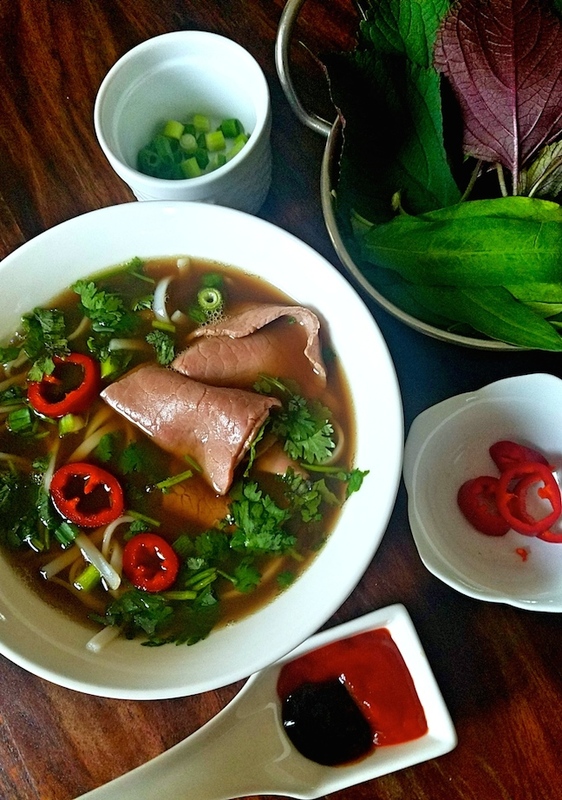 Here's how we're making our own pho these days. Strain the broth through a fine mesh strainer, allow to cool, then refrigerate overnight. Or go to the next step. Warm the broth in a stock pot over high heat. Add the beef, using a spider skimmer, just until the beef is rare to medium rare. Add some noodles to a bowl, top with beef, and broth. Add garnishes such as green onion, cilantro, perilla, and rau ram. Hoisin and sriracha are also popular additions. Hope you enjoy it Terri!! Happy New Year!